Whether for Arabic, Burmese, Chinese, Japanese, or otherwise, the history of linguistically embedded and mediated technologies such as telegraphy and computing defy conventional narratives of “technology transfer” or “diffusion” that have long guided our understanding of how industrial, military, and other apparatuses circulated from Western sites of invention to Non-Western sites of adoption. One could never simply “install” an Arabic typewriter, or “turn on” a Chinese word processor. Each required engineers, language reformers, and everyday practitioners to engage in long, often anxiety-ridden, and always asymmetric engagements with Latin alphabet-centric technologies, with the result often being the dramatic transformations of the Non-Western script in question (but, quite often, often with the subtle transformation of the technology as well).Prof. Mullaney will argue that it is time that the historiography, archives, and theorization of “information” reflects this history, its global dimensions, and the asymmetries that continue to be embedded therein. 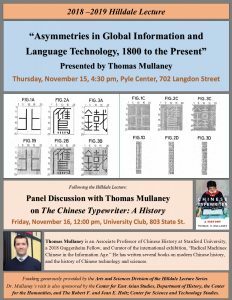 Thomas S. Mullaney is Associate Professor of Chinese History at Stanford University, and Curator of the international exhibition, Radical Machines: Chinese in the Information Age.